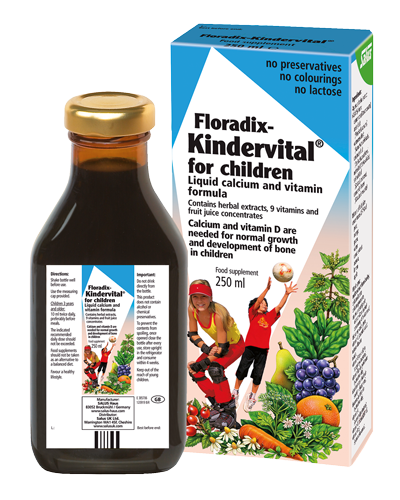 Floradix Kindervital is a delicious food supplement for children providing vital calcium and vitamin D which are needed for normal growth and bone development. 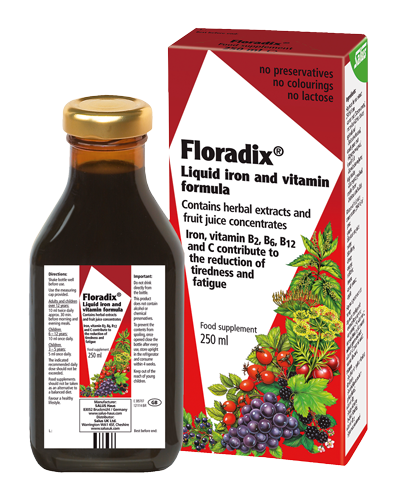 Floradix Kindervital contains several fruit juice concentrates and selected herbs for a pleasant, slightly malty, taste. 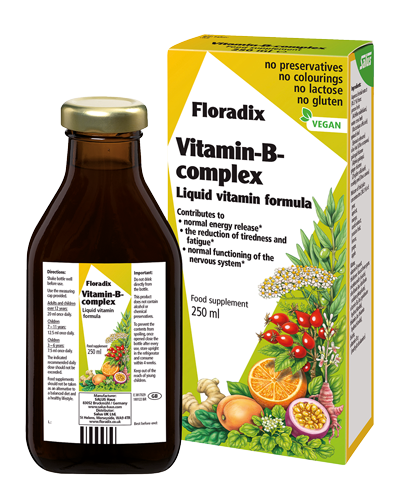 Floradix Kindervital contains no alcohol, preservatives, colourings or artificial flavourings. It is lactose free and suitable for vegetarians. 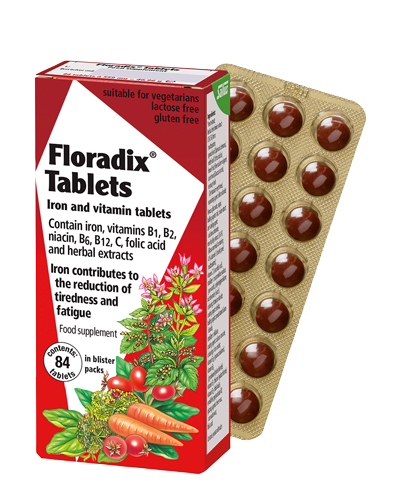 Floradix Kindervital is suitable for children from three years and above. It can also be recommended for adults. (43.4 %) from: carrot root (Daucus carota), anise fruit (Pimpinella anisum), watercress herb (Nasturtium officinale), coriander fruit (Coriandrum sativum), nettle leaf (Urtica dioica), spinach leaf (Spinacia oleracea), camomile flower (Matricaria recutita). Mixture of fruit juice concentrates (27 %) of: pear, orange, grape, water, carob extract, acerola, lemon, apple. Maple syrup, malt extract from barley, calcium lactate, calcium gluconate, aqueous rosehip soft extract (Rosa canina) containing 4 % vitamin C, thickener: carob gum, vitamin C (L-ascorbic acid), natural flavour, nicotinamide (niacin), vitamin E (as d-alpha tocopheryl acetate), vitamin B6 (as pyridoxine hydrochloride), riboflavin (as riboflavin sodium phosphate), thiamin (as thiamine hydrochloride), vitamin A (as retinyl palmitate), vitamin D (cholecalciferol), vitamin B12 (cyanocobalamin).